Amazing one-pan pork chops recipe prepared in under 30 minutes. Smothered Pork Chops in a creamy garlic mushroom sauce. Season pork chops with salt, pepper and paprika. Heat 1 Tbsp butter and 2 tsp oil in a large pan over med/high heat. Once hot, sear chops 3-4 minutes per side until golden brown. Remove pork chops and cover to keep warm. In the same pan, add 1 Tbsp butter and sliced mushrooms. Cook 2 minutes over medium heat, or until lightly golden. Add 1 Tbsp butter and onions. Lightly season with salt and pepper. Cook 3-4 minutes, until onions are tender. Add minced garlic and saute 30 seconds, stirring frequently. Add flour and stir vigorously for 30 seconds. Add the chicken broth, hot sauce, whipping cream and season with salt and pepper to taste. Simmer 2 minutes, or until cream begins to thicken. Add pork chops back to the skillet and cover with the mushroom sauce. 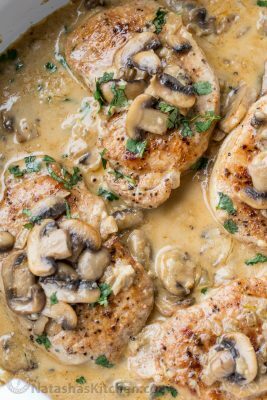 Reduce heat to low and simmer 5-8 minutes, allowing the pork chops to become tender and the flavors of the mushroom sauce to penetrate into the pork chops. Garnish if desired and serve.